IntraFish Media presented their 2018 Person of the Year award to Trident Seafoods CEO Joe Bundrant (O’Dea class of 1984) last week during Seafood Expo Global in Brussels. Anthony Rivisto ’01, released his first published book, “Nothing Wasted.” Get a signed copy at www.iamvisto.com. Congratulations Jason Palacpac ’02, and wife, Cindy (HNA grad), on the birth of their first child, daughter, Irie Ibarra Palacpac, born on May 8, 2018. Nick Dragovich ’04, a firefighter paramedic with Bremerton Fire Department, recently participated in both the Firefighter Stairclimb and the Big Climb, to raise money for the Leukemia and Lymphoma Society. 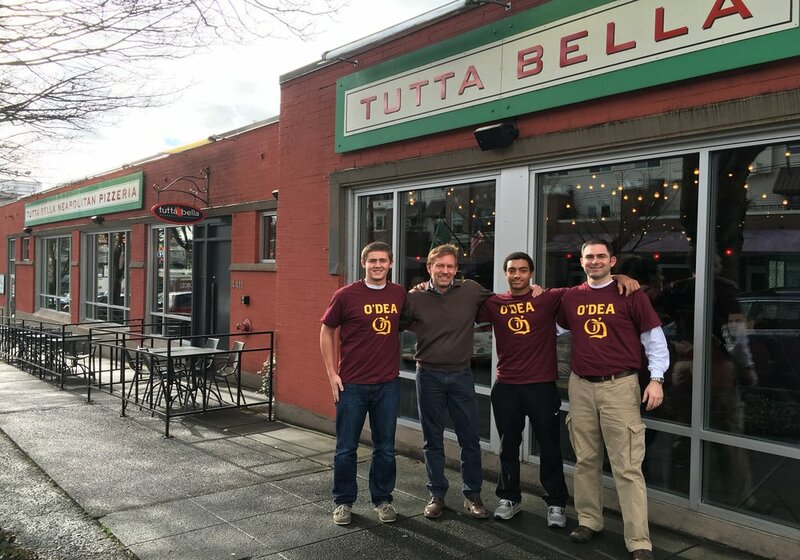 Nick is passionate about this cause and encourages the O’Dea family to participate in these events in the future. Devanté Curry ’11, graduated from the firefighter academy in May 2018. Dominique Gates ’17, graduated with the Superintendent of the Naval Academy Award (#1 in his class)! Dominique received a gold officer’s sword. Holden Jeffries ’17, earned placement on the Gonzaga University Dean’s List for Fall semester 2017. Students must earn a 3.50 to 3.84 grade-point average to be listed. To receive quarterly updates of what is happening at O’Dea High School please be sure to check out our new eNews publication, O’Dea Today. If you are not receiving this publication it may mean that your contact information is incorrect or out of date. To update your information or notify us of a big event, such as a marriage, birth of a child, new job, etc. please email Alumni Director, David Mazzeo, at dmazzeo@odea.org.